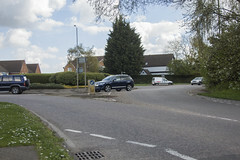 The sensor is designed and optimised to measure carbon dioxide levels found in the air around photosynthesising plants and small, respiring animals. The unique disc shape lets the sensor become the lid for respiration chambers or placed on a desk without the need for clamps and stands. the other for quantitative work on CO2 levels at high levels. Unique shape allows the unit to form a lid for beakers and conical flasks. The compact design of the sensor uses absorbance of infra red energy by CO2 to measure levels. Provision for pH, conductivity, Oxygen electrode and temperature sensors to pass through sensor body. Ranges make it unsuitable for measurement of CO2 from reactions, the yield form these reactions will quickly overwhelm the sensor limits. M6 threaded support point, mounting rod included. 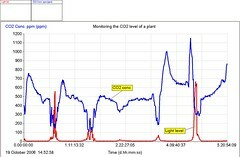 The investigation uses a Carbon dioxide sensor to monitor the changes in carbon dioxide around a plant. You should easily see a strong relationship between light and CO2. Uses a whole living plant. Perhaps the answer to why does everyone start yawning at the same time! There is a lot of concern at present about the impact of carbon dioxide levels in the atmosphere and how it will affect the climate. What is less obvious to many people is what levels of carbon dioxide are present in their immediate surroundings.Here is an activity to see what is present and how it varies.